Being able to add links to your Instagram stories is HUGE. You make it so simple for your audience to do what you’ve asked – they see or hear something they like and all they have to do is simply swipe up to see more. It’s not overwhelming, it’s not pushy – it’s a really good strategy to gain more traffic and subscribers. BUT here’s the bad news… it’s not available to everyone. 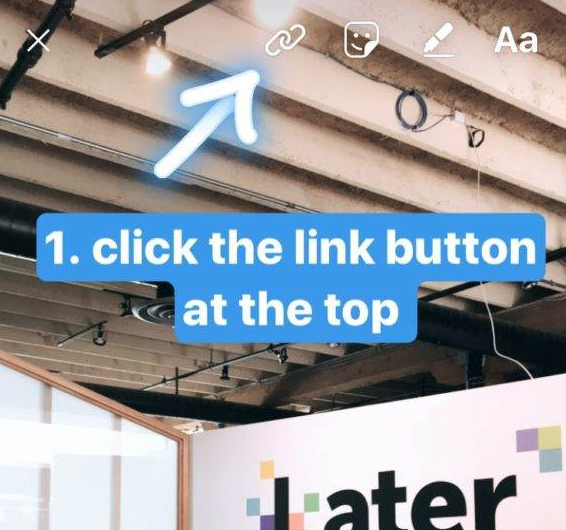 If you’re wondering how to add a link to your Instagram Story, it’s probably because you can’t. The actual set up is pretty simple – right up in the top corner beside all the other options (like text, pens, and stickers), there is a little link icon. From there you simple ad a link in the designated line, hit ‘done’ and you’re good to go. Instagram has limited this feature to only accounts with 10,000+ followers. Originally it was only available to verified accounts so it appears like Instagram is rolling the feature out slowly – but we don’t really know if it will ever be available to everyone. Add a super simple text link on screen. I know this isn’t the same – it still requires someone to go to their browser and type BUT if they do, you can guarantee they want what you’re talking about. This is an example of something I’ve done on an Instagram story talking about my latest blog post! In hindsight, I probably should have made this URL even shorter and simpler but it’s not too bad. I definitely wouldn’t do anything longer. You can also write ‘link in bio’ which works well. I kind of like the on-screen link though because it works even if people find you through the explore page and don’t want to go to your profile. It just cuts out an additional step for the viewer. The key to making this strategy effective is making it EASY. 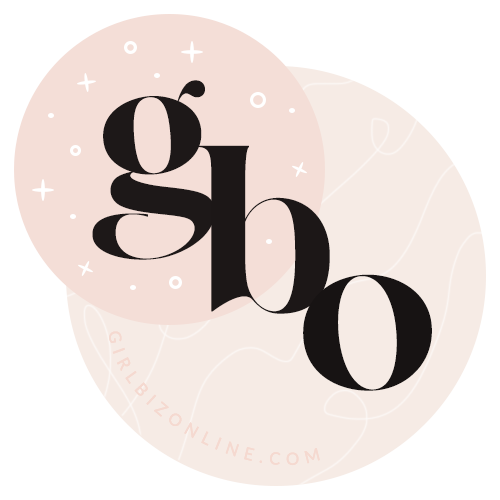 I use Pretty Links to shorten any long URLS into something super easy to type and very memorable. I use this instead of a shortener like bit.ly or the Google because I want to use real words that are easy to remember and type in – nothing complex and confusing like bit.ly/1gy6k …. it’s just another hoop for your audience to jump through! I almost ALWAYS add text to my Instagram Stories because several studies from brands on Facebook have found that, on average, 85% of video is watched with the sound off. Now I know that that’s Facebook and this is Instagram – but the markets are fairly similar. Most people nowadays have both Facebook and Instagram – so to me, the numbers probably ring true on both platforms. I’ll write a little sentence about what I’m talking about that catches people’s attention and makes them want to turn the sound on or follow my link. It makes a big difference! Make it REALLY enticing for them to click the link in your bio. Not having the ‘swipe up’ feature does not mean that you can’t still get clicks from your stories. It just means you have to make it essential for them to put in the extra work of following your link or finding the link in your bio. It’s an added barrier in the way of them doing what you’ve asked – so you’ve got to make the offer worth the extra effort. Notice in the picture above how I make the call-to-action really enticing. 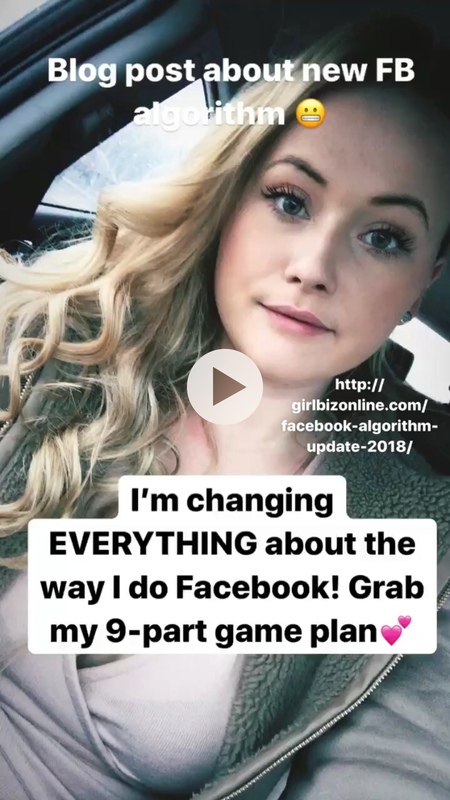 “I’m changing EVERYTHING about the way I do Facebook”. Now that’s a headline, if I do say so myself. And it’s true – I did create a whole new game plan and I did really want them to grab it and make these changes too. I think specifics are the key here – you need to give specific details that make it impossible to ignore. They want to know what I’m doing differently and WHY the plan is 9-steps. All these little details reinforce their hope that they’ll learn something really new and valuable – which makes them really want to see what the plan is. It’s similar to when you’re crafting your CTAs to get someone to opt-in to a freebie. Make it specific, make it attention catching, and make them see what VALUE they’ll get by following your link. Pro-tip: Don’t just promote your content on your stories. Show your face, your personality, your know-how, and your life. People are much more likely to follow links or do what you ask if they feel like they know and trust you. Run an Instagram Stories ad. 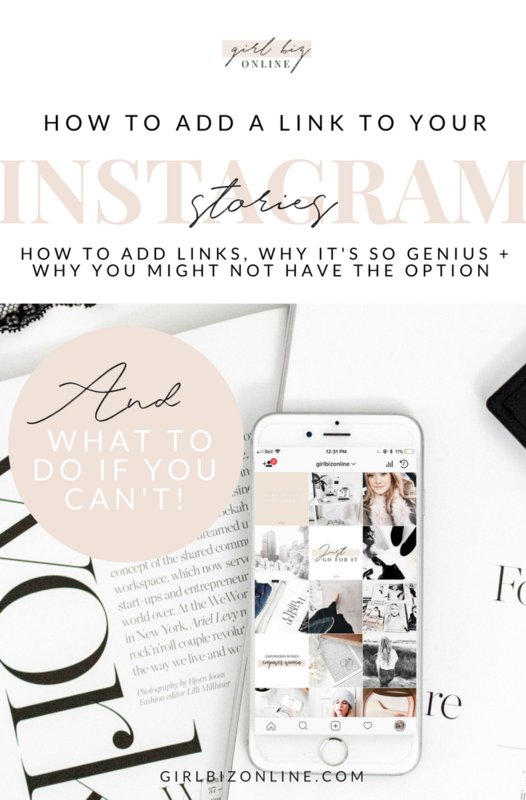 If you’re really trying to get traffic to this page – whether it be your online store, an opt-in page, a sales page, etc. – you might want to consider running an ad to it. Instagram story ads can be VERY profitable – cutting down the cost per lead huge compared to other forms of Instagram and Facebook ads. Plus, your ad will get that coveted swipe up option making it super easy for interested viewers to get the content you’re giving! I know you might be scared of investing in your biz – but if you have a product to sell or an email list to grow, running ads can be the first step to getting you to your big goals. You have to spend money to make money – in some cases, this is absolutely true! Want some stock photos to help you step up your Instagram game? Don’t forget to grab the password to the free resource library! 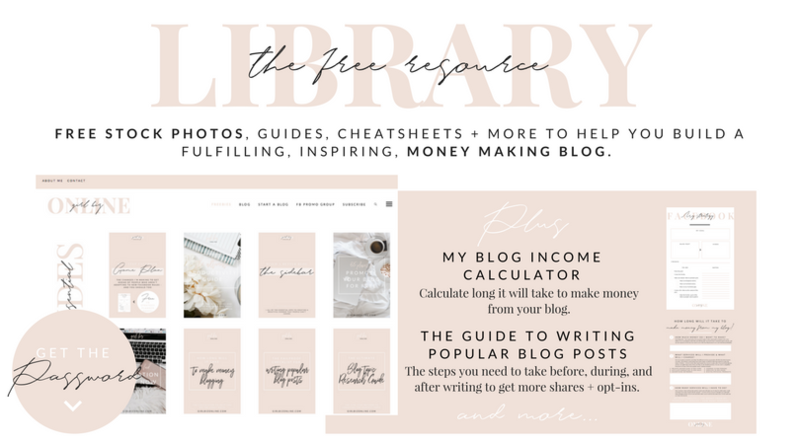 I have some beautiful stock photos that you can use on your Instagram and you can steal the rest of my secrets to building a money-making blog. lots of article found with the similar searches but they were unable to give proper solution but this article make me happy with the helpful screenshot and content you shared. Now i can also do what i want. This was super informative and well written. Thank you!